I'm sorry I have not posted much here over the last few weeks. I've been incredibly busy with regular store business. For folks that blog several times a week, or even several times a day, my question is - how the heck do you guys have the time? I always think of Glen Reynolds over at Instapundit. He posts maybe 10-20 times a day all day long, and I figure whatever else he does, his entire life must revolve around his blog. When he's not blogging, he's thinking about blogging, or looking for things to blog about, or conversing with people that write in about the blog. I seem to always have something else to do that needs to be done NOW. Anyway, my goal here is going to be to post at least once a week, so we'll see how that turns out. Ergo Proxy 3 arrived on Friday - we had it air freighted in from Geneon so we could start shipping orders as early as possible. We're shipping it now and all of your pre-orders were filled by close of business on Friday March 23rd. Oh yeah, all of our copies of Ergo 3 in this shipment have the limited pencil board - we'll be shipping those first until they run out. We have a couple more date changes this week - in fact there have been so many lately they are getting hard to keep up with. Tactics 4 was pushed from 3-20 to 3-27, but became moot as it has already arrived. The new company Illumitoon pushed the BoBoBoBo 2 DVD from 4-6 to 5-1. They also announced that the Beet 2 DVD and the BT'X 2 DVD have been pulled entirely from the release schedule and will be re-announced at a later date. Since these titles have sold moderately well, one can only speculate at this point as to what their plans are, but we'll keep on top of things and let you know. Geneon cancelled the Paradise Kiss 3 Special Edition DVD, but the regular edition is still set to street on April 17th. I know I've done a lot of talking about the upcoming Melancholy limited edition boxes. Sam, the product manager at Bandai, told me this week that they are producing exactly 20,000 boxed sets for the North American release, and they were surprised by the massive amount of retailer pre-orders for them that have already been placed. The boxes are made overseas and the order has been placed by Bandai, so Sam says quote "once they are gone there is no more - period". I can almost guarantee you that this box is now, or almost is, sold out in pre-release and will be allocated to retailers by Bandai. Sam said that retailers who order early will be more likely to get the product that they ordered. That's good news as we got our order in on the first day, so our units are right at the front of the line and we will be able to guarantee delivery of boxes up to about the first 500 pre-ordered (we're 82% of the way there now as of 3/23), and I will probably close the pre-order window once we hit the 500 mark. A lot of people have been asking us recently what we plan to do about the postal rate increase coming next month. Admittedly shipping charges have been a point of consternation for us as we try to offer you a great deal of choices, excellent delivery time and quality, and still offer shipping at a reasonable price. We have not increased our shipping prices in 3 years even though all of the carriers have increased their rates to us several times during this period. As shipping has become the 'condiment' of the internet shopping world (you know, serve a lower quality hot-dog but give the mustard away for free), it's become very challenging for us to try to put together a new shipping program that covers our actual freight costs but that fits the requirements of all of your diverse needs. We are currently working on a new shipping program that is similar to what we offer now, with our usual diverse selection or types, carriers, and quality of delivery, but that will also offer more choices for budget minded customers. We'll be integrating the new program into the new order checkout manager, and we would greatly appreciate any input on this subject that you guys have for us. Your comments help us better tailor our program to fit your specific needs, and that's what it's all about. After many requests, we've expanded our trade in program to include video games, even really old ones. Check our trade in FAQ for details. I have two great sales for you this week, one is a newsletter exclusive set of coupons that you canuse across the store, and the other is a nice set of overstocked figure discounts (up to 35% off) that we need to move out to make room for new arrivals. Newsletter subscribers can combine the two offers to save even more! See below for all the info. Coupons are valid ONLY for NEW orders, and are good through Thursday, March 29th only. You can combine the two offers to save even more! Finally, we received a special shipment of art books that I was able to coax away from one of our vendors in Tokyo. Many of these gorgeous art books have been out of print for more than 5 years and since they are extremely rare we might only have as little as 2 or 3 copies of each. Melancholy of Haruhi Suzumiya Limited Edition Box - Available for Pre-Order! Bandai has finally announcd the first DVD that will be available for the Melancholy of Haruhi Suzumiya series, and they have done it right offering not only the first disk, but a beautiful limited edition collectors box to go along with it! This lavish limited collectors edition will include DVD Vol #1 (episodes #1-4) and a gorgeous collectors art box (complete with a storage drawer for your extras!) that will hold all the individual DVD's once released. It also includes the original soundtrack, Cosplay Hair Ribbon, Pencil Board, and an exclusive Iron on! This is going to one of the most important releases of 2007, and we are asking customers to please order now to reserve your copy as this box may sell out in pre-order and not be available after the release date. We have gone very heavy on these and have already placed our initial order with Bandai, however, because they are limited production and will be in such high demand there is a high probability that they will either sell out in pre-order, or they may become allocated which means they might become over ordered and Bandai may only be able to fill part of each retailers initial order. Our customers have already started to pre-book this box very heavily, and we will be working very closely with Bandai to ensure our quantities so that we can guarantee availability for those customers that order with us early. She asks for any aliens, time travelers, sliders or espers to join her. Watching her weird behaviour is Kyon a boy who sits in front of Haruhi and is the only person who talks to her. 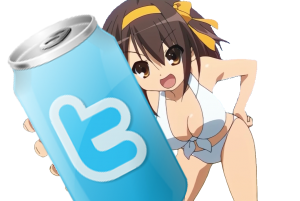 Commenting on Haruhi's joining every club in school and then quitting Kyon unwittingly gives Haruhi an idea to start her own after school club which will become known as the Spreading Excitement All Over the World with Haruhi Suzumiya Brigade (the S.O.S. Brigade for short)! Bandai Entertainment has announced that they will include the broadcast order version of The Melancholy of Haruhi Suzumiya with the special edition DVDs. The Melancholy of Haruhi Suzumiya was originally broadcast on Japanese TV in a non-chronological order, however the DVDs were released in chronological order. Bandai Entertainment had announced that the North American DVDs would also be broadcast order, however with this new announcement, the series will be available in both versions. Broadcast order DVDs were never released in Japan, they will be unique to the North American market at the time of their release. The broadcast order DVDs will be included with the special edition releases, starting with volume 2, and will not include the English dub, they will be in Japanese only with English subtitles. The asosbriogade.com website has a page with further details about the ordering of the series. THE MELANCHOLY OF HARUHI SUZUMIYA REGULAR EDITION SPECS ANNOUNCED; BROADCAST ORDER AND CD UPDATE! February 27th, 2007 (Cypress, CA) – Kadokawa Pictures USA, Inc. and Bandai Entertainment Inc., made a new announcement today regarding the specs for the Regular Edition Vol. 1 DVD of the upcoming hit Japanese anime series, The Melancholy of Haruhi Suzumiya. “After announcing the Special Edition specs at this past weekend's New York Comic Con, we wanted to get the word out on the great features in the Vol. 1 Regular Edition,” said Robert Napton, Director of Sales and Marketing at Bandai Entertainment. In addition to having the first four episodes in chronological order both English-language dubbed in Dolby 5.1 and subtitled with the original Japanese audio, the Regular Edition of Vol. 1 will include TV Broadcast Previews, Making Of… Clip #01, Making Of… Clip #02, TV Commercial #1, TV Commercial #2, Texless Ep.00 Opening, Textless Ep.00 Ending, and three episodes of The Adventures of the ASOS Brigade. Regular Edition Volume 1 will be released on May 29th and retail for $29.98. In addition, up to six CDs are planned for release, with more being discussed, but will NOT be released on the same day as the regular and special editions on May 29th as reported by some news outlets. These will be released sometime later. “Also, a lot of fans at New York Comic Con asked about TV Broadcast Order DVDs. As Mr. Takashi Sakuda from Kadokawa Pictures USA explained, Kadokawa Japan originally didn't want us to release Broadcast Order DVDs at all. Even though we requested it knowing many fans preferred that sequence, the first answer was no,” clarified Napton. Each Regular edition of the four English-language The Melancholy of Haruhi Suzumiya DVDs will also contain many extras with details to come later.